July 2007 – Planet Geek! Every day when I get home I empty out my pockets of loose change and put them into a large glass waterbottle that sits behind my desk. Eventually this bottle becomes too heavy to move and I empty it out to reclaim some cash for toys. It occurred to me that there might be a way to estimate how much money was in the bottle by averaging out weights a little bit. Since my current ‘hottest toy’ want is a new Canon digital SLR camera, my ‘go for it’ point is somewhere around $750. The Coinstar machines now support converting your cash directly into a credit at Amazon without the 9% ‘fee’ they normally extract. Yay! But do I have enough? I started by finding out the weight of an empty glass bottle (the web knows all – 15lbs). 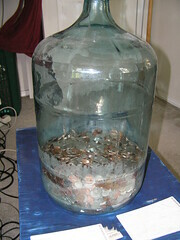 Then I weighed the bottle with all the coins in it (67lbs), which gives me about 52lbs of coinage to work with. Because I don’t really have a distribution chart showing how many coins of each type I have, I assumed an even distribution. There’s probably more pennies than quarters, but I’ve never sorted things out. When I run the Coinstar dump, it’ll tell me how many of each coin I have, and that will make this more accurate the next time I do it. Not quite there yet, but if I wait much longer, I may not be able to move the bottle. Maybe Zach and I will make an excursion to the Coinstar machine and shovel coins into it for a half hour, and see how accurate my numbers are. True victory happens when I get down to single digits, but that event should be heralded by fanfare and balloons, it happens so rarely. In case you were curious about how much mail flows through my account daily, here’s my catchall report. Of this, probably 80% is mailing list traffic that’s foisted into various folders by procmail. The rest is In My Box, baybee. Vacation or Fandango, you decide! Number of power windmills seen:			6 ! All in all, it was about as good as trip as possible given the huge mileage involved. I think my limit for long distance driving by myself is around 500-600 a day. And even that I don’t know if I could keep up for several days in a row without break. The drive out was much easier due to the 3 work days in NJ. A quick note about NJ. While I was there I googled around and found a pickup volleyball group in Princeton that plays on Tuesday evenings. I got in a good 2+ hour session of indoor playing, which helped offset the slug-like demeanor I was adopting. Indoor volleyball is weird – nothing like a popped-up ball bouncing around in basketball fixtures like a pachinko setup. Sheesh. As to the camping, southwestern PA is absolutely beautiful – we were almost in West Virginia, and the weather really was perfect for a large (150-people ish) outside event. Temperatures during the day stayed between 70 and 85, and at night it got down to the low sixties. It only rained the first night, and we had the trailer all set up by then. And before the purists get on my case. Yes I was camping in the sense that I was sleeping in a non-fixed environment without plumbing or heat or electricity, in a place that had only rudimentary facilities. But yes, it was a camper trailer, yes there were hot showers and plenty of water, and yes there was a fixed building nearby. I still say there was a roughing element to it because of no fixed plumbing. Any place that necessitates the use of portapotties is still ‘camping’, so there. And now we return you to your regularly scheduled life. So while I’m out on the road, I try to keep myself reasonably in shape. At home, I have volleyball and the like to keep me active, but in a hotel room in Princeton, NJ? Not so good. Fortunately, I can bring my bicycle with me, and I’ve worked out a schedule where I can spend 8-9 hours in the office, hop on the bike, ride for an hour or two, and have a nice satisfying wind-down dinner then a shower at night. Works out pretty durned well, but I was curious -how- well it was working. The net is FULL of calorie counters. Most of them seem to be pretty much garbage, with a lot of commentary making vague comparisons about which is better for you, how much time you’re spending, etc. I finally tracked down a decent calculator that takes into account my own weight, how vigorous I was riding, and how long I was on the road. Tonight I rode about fifteen miles, and according to the calorie calculator on WebMD.com, that means I burned a little over 800 calories in my ride. That feels about right, it was a decent length ride, I could feel my heart rate up, I was sweating, and I feel a little tired, but not wiped out afterwards. I think I offset the cake, and then some, which is what I wanted to do! Now I’m back in my room, getting some work done, and soon I’ll snuggle into bed. I’ve found a couple possible pickup volleyball games for tomorrow night nearby, we’ll see if anything comes from it. Occasionally, things come out all right. While out at Canobie Lake Park yesterday with the fam, I chanced to note my Treo had shed another component of itself. I’ve been missing my stylus for quite a while (I go through about one a month), but I also noted my 2gig Sandisk SD card has ejected itself. This occasionally happens when I drop the Treo pretty hard – but it usually just ‘unclicks’ the card, and I just shove it back in. This time apparently the card had escaped completely. There wasn’t anything particularly important on it – I usually use it to move pictures from the Treo to yawl, but I have a half dozen apps installs on it also (including GeoNiche, an outstanding bluetooth GPS client specifically designed for Geocaching). The cards cost-wise are down on a par with packing material, so I was at best a little annoyed. It’s nice when things actually go your way on occasion. Even if it only involves a little $15 memory card. 50 Years ago, history was made. An excellent story on the history of this masterpiece is in The Star. Yesterday I went out and played volleyball. Once I drove a half hour to play with a lunchtime group out in Westborough. That was good, and got some excellent 3-on-3 on a sand court. Then, after picking up my son at camp at 6pm, and having dinner with Cat, I wanted to swing by and verify a rumor I had heard about a pickup game that happens Mondays and Wednesdays in Framingham. Sure enough, I found it, where 13 or so folks were in a casual pickup game. I stopped, Zach hung out in the van while I played a quick game with them, then drove home, arriving a little later than I had wanted to, but feeling nicely worked out. If I wanted to, I now know of pickup and quasi-league level play 6 days a week, in fact, could even play twice a day, once during lunch and once in the evening. Maybe I need professional help.